Made by Robert Stephenson-Hawthorn Ltd in Darlington, England, 1950. Self-propelled rail-mounted seven ton locomotive crane in the form of a tank locomotive. It has a swivelling non-winch jib which operated with three separate hooks. The jib is 21 ft 9 inches (6.63 m) in length and is tapered in design and constructed of steel plate. The outer hook at the end of the jib could lift 3½ tons, the centre hook at 16 ft (4.88 m) along the jib could lift 5 tons and the closet hook at 12 ft (3.66 m) could lift 7 tons. The long jib is acitvated via a steam cylinder and piston arrangement and has a 3 ton counterweight balance weight. It can be rotated under its own power to pick up material next to and around the crane locomotive. When the jib was in the forward position, a hole in it allowed smoke from the chimney to escape. Total weight empty: 34 tons 2 q. The earliest crane locomotive was built by the Scottish firm of Henry Dubbs & Co., Glasgow, for internal use in the works from 1868. Many similar engines were built subsequently by this and other British locomotive builders until as recently as 1950. 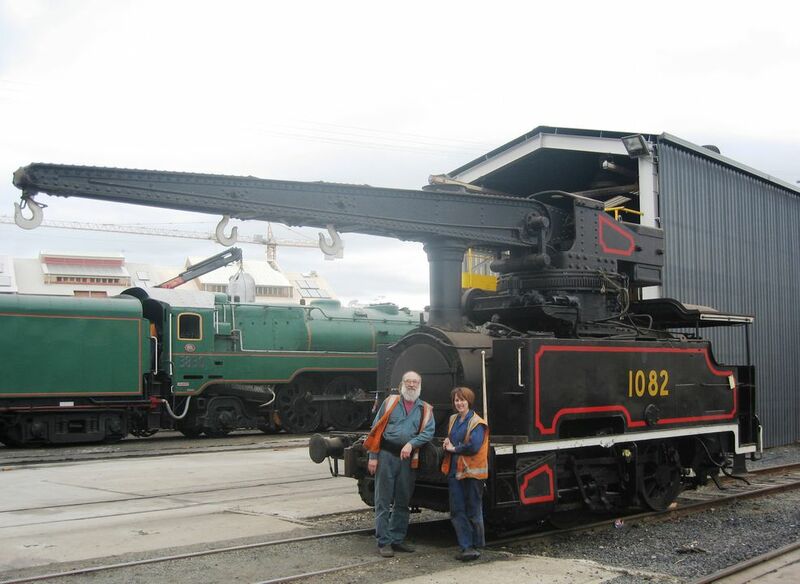 This 7-ton crane locomotive was one of 8 in the NSWGR's X10 class of locomotives. It comprised something of a mixture of left over locomotives including crane locomotives, breakdown cranes, and coal grabs, devised in the new numbering scheme of 1924. The first six 0-4-0T side tanks crane locomotives were supplied by Hawthorn, Leslie & Co. of Newcastle-upon-Tyne, England. The first two were delivered in 1914, Nos Lo 10 and Lo 11, followed by repeat orders of Lo 40 in 1923, Lo 41 and Lo 47 in 1924 and Lo 48 in 1925. These locomotives were renumbered in 1924 as 1051, 1052, 1066, 1067, 1068 and 1069. In early 1950 the reconstructed firm of Robert Stephenson & Hawthorn Ltd of Darlington, England, delivered the last two cranes, Nos 1082 (this crane loco) and 1083. Robert Stephenson & Hawthorn Ltd (RSH) was formed in 1937 when the famous locomotive builders, Robert Stephenson & Co., then based in Darlington, acquired the engine building department of the Newcastle-based firm of Hawthorn, Leslie & Co. The numbering of RSH locomotives began at 6939 as this was the next number in line after the sum total of locomotives built by the two companies, Robert Stephenson and Hawthorn Leslie. This crane locomotive has the builder's number 7542. In 1955 RSH became part of English Electric and engine building in Newcastle finished in 1961 and Darlington in 1964. Crane locomotives have been supplied to railways around the world. A total of 29 came to Australia, the first of which arrived in 1879, built for the New South Wales Government Railways by Dub & Co. Others were built locally, or converted from existing locomotives in railway workshops, some temporarily, in the case of New South Wales, for coaling cranes and for ash-handling at locomotive depots. The New South Wales Railways operated the largest number of crane locomotives in Australia: a total of 25, although they were not all in service at the one time. In early 1950 this steam crane locomotive (No. 1082) was delivered to the Railways, and it went into service on 10th February 1950. It operated at various Sydney railway workshops including Chullora and the Clyde Wagon Workshops and was still in service at Eveleigh Workshops as late as 1983. It was donated to the Museum in 1994 by the State Rail Authority of New South Wales and for many years was stored, together with some of the Museum's other rolling stock, in the Large Erecting Shop at Eveleigh. It was moved to the Museum's Castle Hill store in 2008.